The mystery Google barge in San Francisco Bay that's stacked high with containers over 4 stories high is an invitation-only "luxury showroom" reports CBS KPIX. 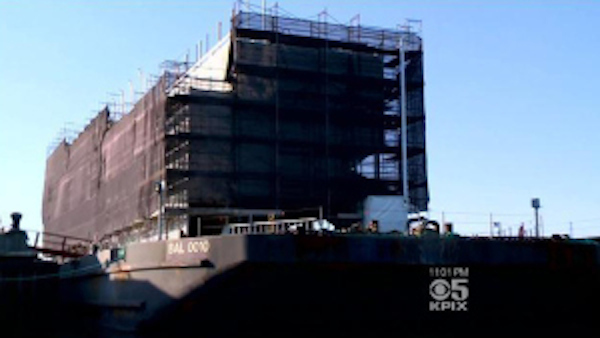 Google's mysterious barge in San Francisco Bay will feature luxury showrooms and a party deck to market Google Glass and other gadgets to invitation-only clients, multiple sources told KPIX 5. The project, which has been in the planning stages for more than a year, was created at Google[x], the secret facility that Google reportedly runs near its corporate headquarters in Mountain View. It is personally directed by Google co-founder Sergey Brin and is Google's attempt to upstage rival Apple and its chain of popular retail stores, sources said. Really?! Apple stores are gleaming white, glass and metal architectural wonders and they are moored in the best high traffic locations -- not high tide locations. They are retail super-sites making more money per square foot than luxury jewelry store Tiffany & Co.
Google's barges look like barges, ugly container ships. How will that image sell Google Glass? Google always consults on its decisions with its store of Big Data. I consulted my data of common sense and it doesn't work. Waterfront locations are great for sea food restaurants and leaving on a cruise trip but not for buying glasses or smart watches. Stacks of containers doesn't say "buy me." I would only buy Google hardware because it mattered to me and not because I drank a cocktail inside a container barge. And I would buy online.